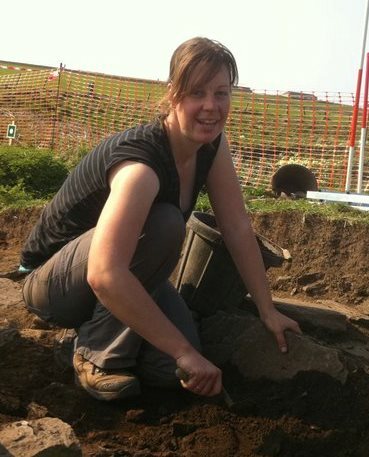 Katie Campbell joined the AAREA team to carry out the work placement element of the MSc in Digital Heritage at the Department of Archaeology, York, and describes here her work with AAREA PhD student Tabitha Kabora on the hydrological modelling aspect of the project. Besides an interest in the subject matter and objectives of the project, I joined the team hoping to apply some of the GIS and photogrammetry skills which I had been learning as part of the masters’ course by putting them to a practical use. To this end Tabitha suggested that we try to create a digital elevation model (DEM) of Engaruka from existing aerial photography of the site. Currently the only accessible elevation data is NASA’s ASTER global DEM which has an accuracy of up to 30m for the study area, whereas structure from motion software is capable of creating a DEM with up to 3m accuracy from aerial photographs. Such a dramatic improvement on accuracy could have an enormous impact on the results of the hydrological modelling and would prove an important basis for further analytical investigation of the area. Aerial photography of the area taken from a light aircraft in the 1960s was the best data available for creating of a DEM using the software Agisoft photoscan, and so four pairs of photographs were selected in order to test whether the technique would work. However, as these were analogue photos, which had been scanned and cropped for storage, the software would not process them effectively without some pre-processing in Adobe Photoshop. Once the pairs of photos were processed into four complete, usable photos, they were input into Agisoft photoscan and the DEM creation workflow followed. 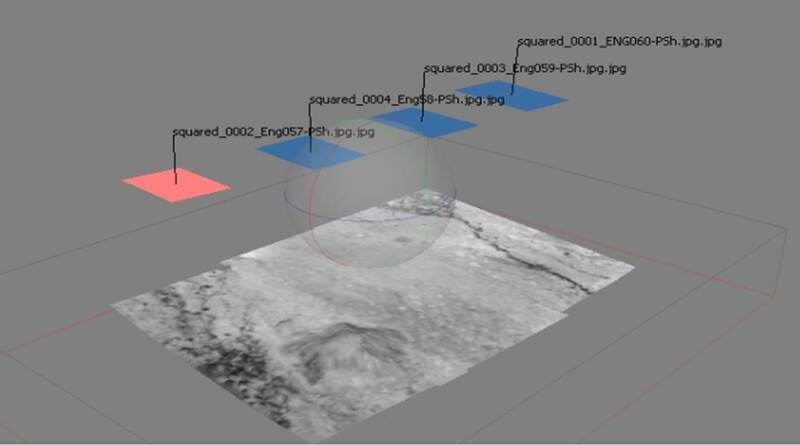 This created a 3D model of the landscape, which could then be exported as a DEM. Once it had been georeferenced by overlaying it on a 2002 satellite image, this DEM and the aerial photo image data were then imported to ArcGIS. 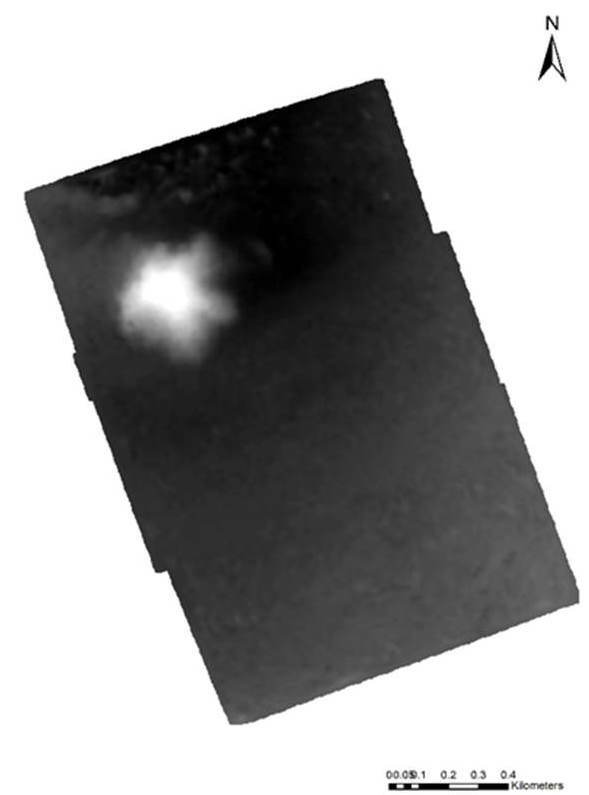 Screen shot of Agisoft showing aerial photos georeferenced to the 2001 satellite image. Once imported to ArcGIS, the DEM was given real heights from existing data and then examined for accuracy relative to the ASTER global DEM. Extensive interrogation showed that there had been some issues with the DEM creation, and so the complete DEM creation process was then examined to see if it was possible to find the cause of these problems. The process was repeated on a more powerful computer to see if this might improve the output, however similar problems remained, so other factors have been considered. Lens distortion in the source data, unbalanced georeferencing and human error during processing now seem the most likely candidates for the inaccuracies in the resulting DEM. Although the intended of accuracy was not achieved in this process, a DEM was successfully created from historic photos and allowed us to define a comprehensive method for testing its accuracy against the ASTER global DEM. This has implications for both the use of existing aerial photographs to potentially create a usable DEM for modelling. The process is relatively simple and cheap (compared to ground survey) and has particular relevance to areas for which reliable mapping and satellite data is not easily available. Rather than rely on these historic ‘analogue’ photos, Tabitha is currently back in Tanzania to conduct a new aerial photographic survey using a drone quadcopter, combining this with a hydrological survey of the rivers that formerly fed the ancient irrigation system. These new digital aerial photos will be used to create a DEM using much the same process outlined above, but the historic photos will nevertheless be georeferenced and incorporated within the Engaruka GIS as they remain important visual sources for the interpretation of the archaeological features at the site.